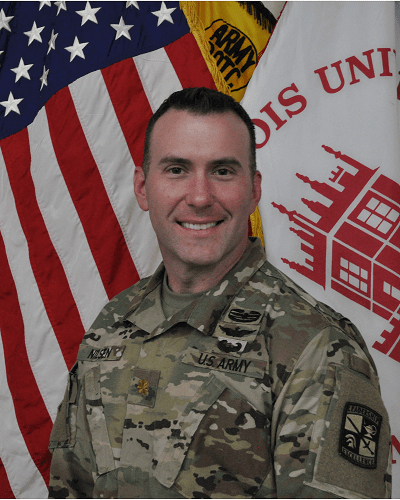 Lt. Col. Karl Nilsen, NIU Military Sciences Department chair, will be the Soldier of the Game during the Chicago Bears vs. Seattle Seahawks game 7:15, Monday, at Soldier Field. A deserving member of the military is honored during an on-field recognition during the third quarter of each Bears home game. Nilsen will be accompanied by his wife Kathryn and sons Clark and Bruce. Nilsen, a native of Elgin, was commissioned as an aviation officer and pilot of the AH-64 Apache Attack Helicopter in 2002 after graduating from the United States Military Academy at West Point. He has deployed three times in support of Operation Iraqi Freedom and New Dawn with the 4thInfantry Division and Office of Security Cooperation – Iraq. His numerous awards and decorations include; The Bronze Star; Meritorious Service Medal; Air Medal; Iraqi Campaign Medal; Senior Aviator Wings; Air Assault Badge; and Combat Action Badge. He holds a B.S. in European History from West Point, and an M.A. in Management from Webster University. A solider selected for this honor has to be nominated by another service member or his/her leadership; be a solider in good standing; and have been deployed to a combat zone at least once. “That last item holds a lot of weight. We want soldiers recognized and to show them that there is a community and nation that appreciates and respects what they do,” said Lt. Col. Matthew Gregory, with the U.S. Army Public Affairs Office.